Welcome to the "Love Your Pet" Blog Hop! 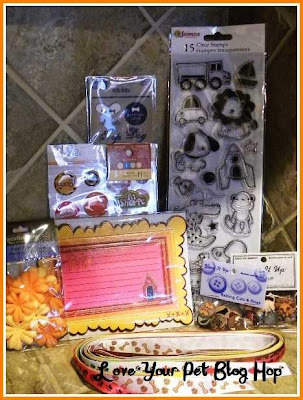 This hop is being hosted by Abby from Scrapbookaholic by Abby. If you just arrived here mid-hop, you might want to start at the beginning, at Abby's blog. Abby started this hop to spread awareness that April is the ASPCA's "Prevention of Cruelty to Animals Month". They encourage people to "Go Orange for Animals", which is why all of our projects use orange and animals. I made my card using a 3" dog cut from Nate's ABCs. I gave his ball some texture, blinged his collar up with some gems, and die cut a label for my sentiment from My Creative Time's "Just a Little Note to Say..." stamp set. The sentiment continues on the inside of my card. 8 1/2" x 5 1/2" Papertrey Ink Dark Chocolate Cardstock, scored at 4 1/4"
Papertrey Ink "Angeled Labels Die Collection"
If you would like to learn more about the ASPCA, visit their website or go here to donate/become a member. Also, Abby has this super fun blog candy to give away to somebody who leaves a comment on all of the blogs in the hop by the end of Sunday. How ADORABLE!!!! LOVE it!!! Thank you for doing this with me!!! What an adorable card. I'm loving this puppy. I love that card! The colors are so pretty together and I love how you embossed and blinged to add interest! Very cute card love the colors! love this card and the cart is really growing on me! Adorable, Katie. Always such a treat to stop by your blog and see what you are up to. Thanks for sharing! loving this blog hop! your card is adorable, i really need to get that cart!! what a Cute card you made!!!! Love the colors!!! TFS!!! I am now a follower and I "liked" you on facebook, I am really enjoying this hop! Very, very cute! That Nate ABC's cart is one of my next purchases!! Thanks for sharing! 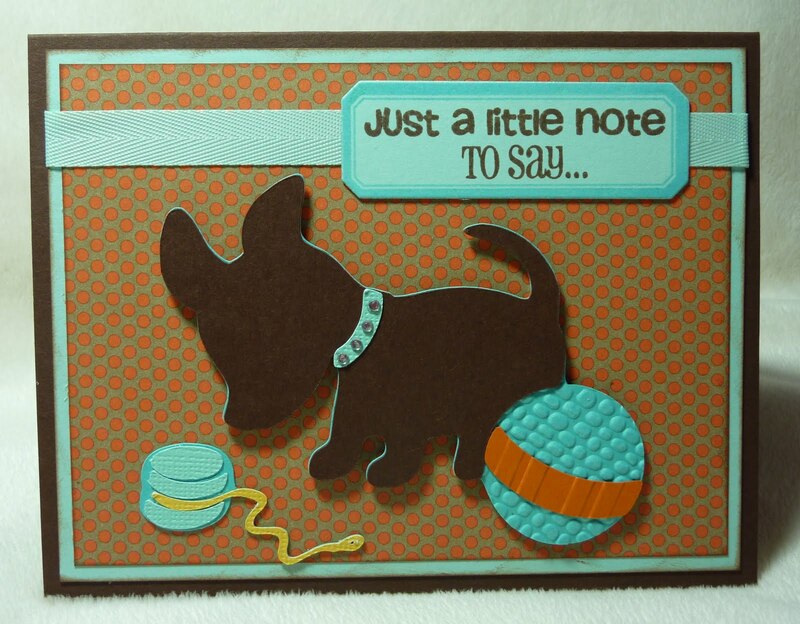 Love your playful pup on your card. Sooooo cute!! Love the color combo!! thanks for sharing!!! I super duper love the color combo you used and that little of texture on the ball was magic! I am thinking Happy, love all the blog candy!! Which 6 Shih Tzus it would come in handy. OMG, that is such a cute card; absolutely love it! !-Pat N.
Oh my goodness - what a sweet card! LOVE it! Adorable card! Nice use of the orange and what a great reason for a hop! Adorable card! I stopped by to say that I love your blog! I have an award for you. Please stop by and pick it up! Cute cute cute! TFS! This is such a fun hop! I just love the orange swiss dots, they bring the card to life. Really cute card, love the bling collar! thanks for sharing. Precious cards, love the color selections! This card is adorable, reminds me of my late pup, Anna, she was all black. Precious! TFS, I am a new follower! Great card! Love the cute little dog you used. Thanks for being part of a blog hop that helps the ASPCA promote awareness of cruelty to animals. Awwww....your card is so sweet!! Your card is cute. Great job. A very sweet card. I like the texture and the sentiments were perfect. Thank You for sharing in the hop. So so cute Katie. Love the textured ball and your sentiment. OMG this is such a cute card i love the dog he looks so darn cute. I like the embossing you did on the ball. Really cute! I loved the colors you used. The card is adorable and I love the sentiment. Love your card! The ball is perfect! I absolutely LOVE this card! The colors and the images. CUTE! 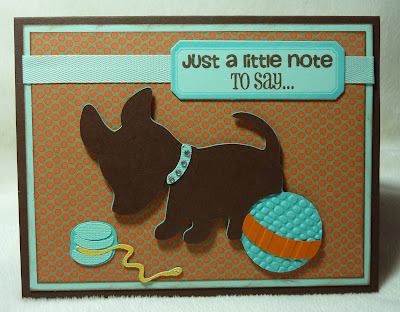 This is a SUPER cute card--I love the color palette and the embossed ball--adorable! the colrs on the card I really like. but then again.. the card rocks with cuteness!! Love your card. Great color combination. Love the card, Katie! Adding the toys for the puppy was such a great idea. I also love the color combo you chose. adorable! i wanna get that cart! Your card is so cute, Katie! This little dog reminds me of one I had when my son was little. That was a very long time ago as he is 39 now! Thanks for taking part in this very important cause. katie, this is just adorable! I love that little doggie! cute cute cute! That is so adorable! Love that cute little dog! Your work is very pretty! TFS! A very well constructed and written article, thank you for posting this! I love your craft! Do you teach other people or do you sell your crafts? 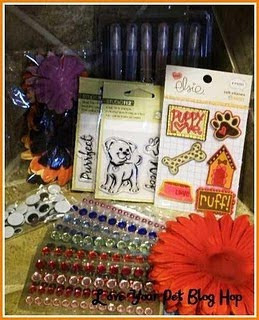 Those are lovely gifts for my dog loving friends. great card, love the extras, sure makes your card pop! TFS!